A healthy, delicious and easy to make dish ideal for school or office lunch, weeknight dinner or for a slow lunch. Best served with raita. 1. Heat little ghee and oil in a pressure pan over medium flame. 5. Add ginger garlic paste, green chillies and stir well. 6. Add curry leaves, chopped methi leaves and stir. 7. Add turmeric powder, coriander powder, garam masala powder, red chilli powder, cumin powder and salt. 8. Stir well and pour 2 cups of water. 9. Simmer for 30 seconds and add the rice. 10. Cover with a lid and cook on low flame for 2 whistles or until the rice is cooked. 11. Remove the lid and garnish with coriander leaves. 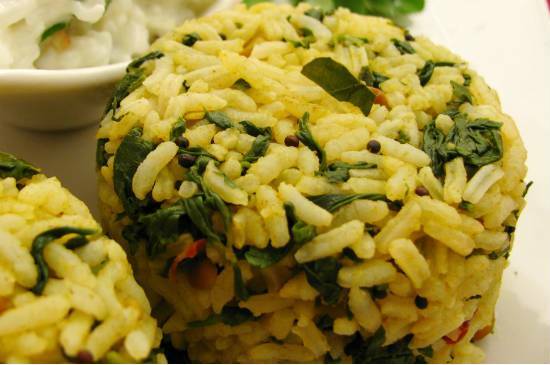 Feel free to comment or share your thoughts on this Methi Rice (Fenugreek Rice) Recipe from Awesome Cuisine.